Outdoor ambient projects are a nice way to focus massive public attention on especially hard issues. It can be used by social organizations, as well as by commercial (by sponsoring the socials…). 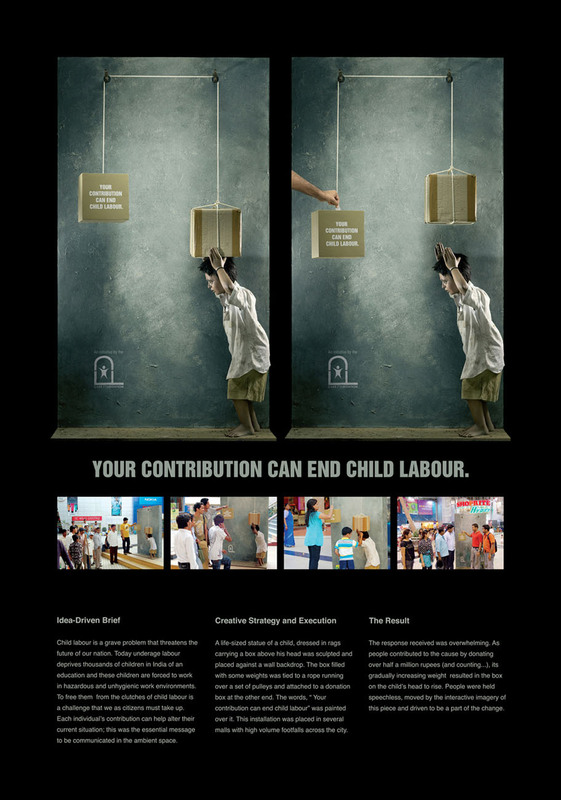 In this case, from India, a problem of children exploitation was used – as a work force. So they’ve put a realistic statue of a kid carrying a pack, a mechanism allowing the passerby’s to relief him, all encouraged with this message: ‘Your contribution can end child labour’. The best part of this idea is the fact, that it shows that individual actions have sense. Exploit kids are not just an unnamed mass with some issue. It’s happening here and now, you can SEE and TOUCH the problem, also your action has an immediate positive effect. Well done. 25 zapytań do bazy. Strona wygenerowana w 0.224 sekund.